Carotid.net General Public Area . : Diagnosis : Brain examination :. 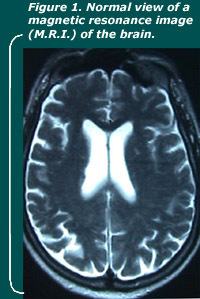 A brain examination is performed using a scanner or M.R.I. (magnetic resonance imaging). The patient lies on a radiological table, which moves through a ring. That ring generates virtual cross sectional views of the brain. Such cross sectional views are reproduced on X-ray film. Each frame is analyzed in search of a cerebral infarction showing the destruction of a portion of the brain. Before deciding whether to operate on a carotid artery, it is very important to know the location of the infarction and whether that infarction is recent or old and whether it has healed or not.